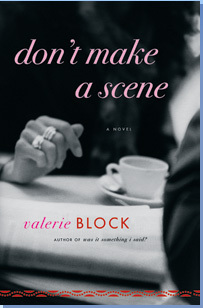 Valerie Block uses tart humor and a deceptively light touch in this fiercely intelligent look at how the movies shape and haunt us, and what happens when the eternal allure of classic movies collides with the daily indignities of contemporary life. Don’t Make a Scene is a refreshing comedy about finding fascination, irritation and joy in unexpected places. As the director of a Greenwich Village revival cinema, and a single woman about to turn 40 who has watched everyone else move on, Diane Kurasik is reminded daily of how her life diverges from those of the stars of the silver screen. Vladimir Hurtado Padrón has troubles of his own: although he fled Cuba a decade earlier, he still can’t convince his estranged wife in Havana to grant him a divorce. When Diane meets and falls for Vladimir, she becomes acutely aware of how far things are veering from the script. Would Ingrid Bergman put up with this? An eviction notice jolts Diane out of her home and her routine – aren’t all New York stories ultimately about real estate? As Diane shuttles between the couches of friends and family, dodging advice and criticism in equal measure, and touring many over-priced Manhattan apartment with tragic flaws, she asks herself: What would it take to be at home? Meanwhile, Vladimir refuses to succumb to nostalgia as he deals with the exile’s dilemma: What happens when you can’t go home? When an unexpected visitor from Vladimir’s past arrives on the scene and becomes captivated by Diane just as her ardor for Vladimir is cooling, Diane considers returning his affections, and wonders if her life has turned into the kind of absurd French movie she shows at her cinema.